Habit: Annual, +- red, staining, hairs spreading, rough, sharp. Stem: +- erect, 2--7 dm. Leaf: basal in rosette, 3--10 cm; cauline few, alternate. Inflorescence: in 2s or 3s; bracts 0 or near base. Flower: +- fragrant; calyx 2--3 mm, circumscissile, lobes generally curved over fruit; corolla limb (3)4--9 mm diam, appendages yellow. 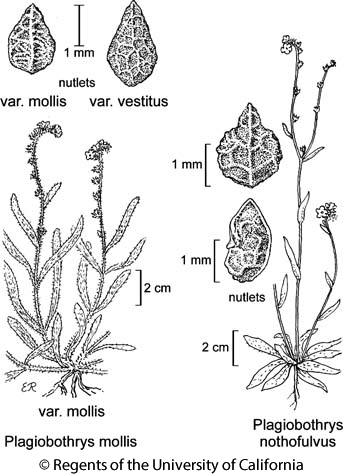 Fruit: nutlets generally 3, +- 2 mm, round-ovate, abruptly narrowed below acute tip, +- arched; abaxial ridge, lateral ridges, cross-ribs narrow; interspaces wide; scar near middle, round. Chromosomes: 2n=24. Ecology: Common; open woodland, grassland; Elevation: generally < 1550 m. Bioregional Distribution: CA-FP; Distribution Outside California: to Washington, Mexico. Flowering Time: Mar--May Note: Intergrades with Plagiobothrys arizonicus, Plagiobothrys canescens. Citation for this treatment: Ronald B. Kelley 2012, Plagiobothrys nothofulvus, in Jepson Flora Project (eds.) Jepson eFlora, http://ucjeps.berkeley.edu/eflora/eflora_display.php?tid=38516, accessed on April 23, 2019.